← DIY Wedding – theme colors is black and white! Hello Bubbly Fun! 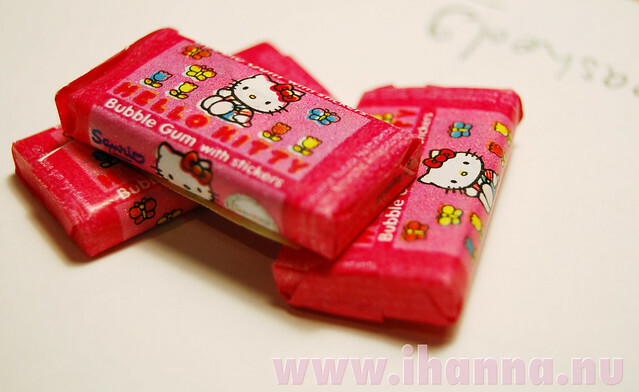 Hello Kitty Chewing Gum! I will present links to fun crafty and arty tutorials here on my blog each Sunday for a while! Also check out part one. This is part two (II) of the Sunday Fun! Enjoy! Free Bib Patterns – I’ve seen these in different styles and they just looks so cute! CD-envelope – made out of papers! Just for fun! Magazine bowl – my style exactly, love the look of this bowl! Kokeshi Doll Ornament – with a cloth pin. I like these cloth pin crafts! Messenger bag with gusset – who doesn’t want to make a messenger bag? Ric-Rack owl tutorial – because it’s a fun and smart way to use that beautiful ric-rack-ribbon! Memory box tabletop – IKEA crafting a glass table with some deep frames. I want to assemblage! Sew Practical Patterns – more sewing with tutorials for tissue holder, appliqu?, rag doll hair, quilting etc. * Albert’s Journal Pages by Kathy McCullen. * COLLAGE PLAY with Crowabout – sign up at Nancy’s blog and come play (I hope we’ll start very soon!)!!! * Drops New Knitting Patterns – that is inspiration, now I know that I need a gray sweater this autumn! Also check out iHanna’s Tutorial Page of course. Lots to be inspired by! Hi hanna – I want to sew some “rabbits” or “dogs” & “cats” (kids toys). Can you, please, advise me any special blogs/ sites/ featuring patterns??? I think you should visit Wee Wonderful’s wee shop and scroll to the end of the page for some lovely patterns of robots, bunnies etc. Thank you for a absolutely lovely blog. I have bought your book and get so inspired – every day. For some years I havent been creative – but now I’m started again – thanks to you and your great blog. I have signed up for the CollagePlay and look foreward to started. I can say how much its mean to me to get started. Thank you for the links…such fun! so glad you like my blog and the book and that you’ll play along with us in some art adventures! I think it will be awesome! I just saw your post about my book – Thank you so much! Take care! Thanks for the great list of tutorials! The paper bag book one is great! I have made them before with the smaller lunch bags, but never this way before! Thanks for these great links! Happy crafting, Hanna! These are some really neat projects. Thanks for the links!